Home » Health » What Is Trichotillomania? Trichotillomania is a condition of abnormality in which the sufferer has an irresistible urge to extract his own hair. In the absence of the ability to prevent themselves from doing a particular act, trichotillomania includes a group of psychological problems called impulse-control disorder. This condition is most commonly experienced by women than men and is commonly found in age teens. If trichotillomania patients try to resist the urge to pull their hair out, there will usually be a feeling of tension, anxiety, and discomfort in them. Conversely, when the desire is fulfilled, they will feel relieved. Many trichotillomania patients deny that they are troubled. When there is baldness, they will usually hide the bald part by wearing a hat, fake eyebrows, or false eyelashes. But not all trichotillomania patients feel happy or relieved after pulling hair. Some of them even feel embarrassed by their behavior and feel inferior because their physical appearance becomes unattractive. Another symptom that can be seen from patients trikotilomania is they like to observe hairs that have been revoked (eg observing the roots) or twisting the hairs. In some cases, people even chew or eat their hair. It is suspected that trichotillomania is associated with abnormalities in the connective pathways of parts within the brain that play a role in regulating motion, emotion, and impulses, and in forming habits. But this is one factor only. The number of other factors that can also increase a person's risk of trichotillomania cause this condition is difficult to infer the cause. According to research, genetic is one factor that is very influential on the formation of trichotillomania. A person with a close family with a trichotilloma is believed to be at high risk of developing the same condition. In addition to genetic, gender and age are also influential. The trichotillomania case is most prevalent in pre-teen women, the age range of 11-13 years, when hormonal changes occur. According to other studies, trichotillomania is sometimes associated with other psychological problems, such as personality disorders, eating disorders, mood disorders, anxiety disorders, and substance abuse. This means that some trichotillomania sufferers also suffer from these conditions. They think that extracting hair is a solution to overcome the feeling of tension, anxiety, stress, and frustration. Unfortunately the wrong thought continues to hold. In addition to the conditions previously mentioned, trichotillomania is also sometimes associated with obsessive compulsive disorder (OCD) in which one of the symptoms is the occurrence of repetition (repetition) behavior. He often pulled his hair so it appears baldness in certain parts only. The desire to pull hair is so strong that it can not be prevented. There was an increased tense feeling before pulling out the hair and feeling relieved when it was finished pulling out the hair. The act of pulling the hair causes stress or affects the patient's daily life, for example at work. Trichotillomania can be treated through psychotherapy. Types of psychotherapy that are generally recommended for treatment of this condition are cognitive behavioral therapy or cognitive behavioral therapy (CBT). Through CBT, patients will be assisted by an expert in turning their negative behavior into positive (in this case is pulling hair). In addition to educating patients about the conditions they are experiencing and how to overcome them, experts will also help patients improve their perceptions of themselves and about how they relate socially. In CBT, sometimes the therapist will involve the patient's family to provide support. Often in the treatment of trichotillomania, CBT will also be combined with drug administration. One of the drugs that is usually prescribed is clomipramine. Although the drug is primarily intended for treating OCD and depression, clomipramine has been shown to be effective in cases of trichotillomania. In addition to clomipramine, other medications that may be prescribed by a physician are selective serotonin inhibitors or selective serotonin reuptake inhibitors (SSRIs), such as fluoxetine and sertraline. In using the above medicines, it is very important for the patient to comply with the doctor's use order to recover quickly and avoid side effects. Many negative effects that can arise from trichotillomania disease. In addition to causing baldness (alopecia), patients with this condition can also experience psychological distress, such as feelings of shame, guilt, and alienation. This may impact on social relations and declining performance in work or education. In some cases, trichotillomania can also cause trichobezoars or the formation of clumps of hair in the stomach. 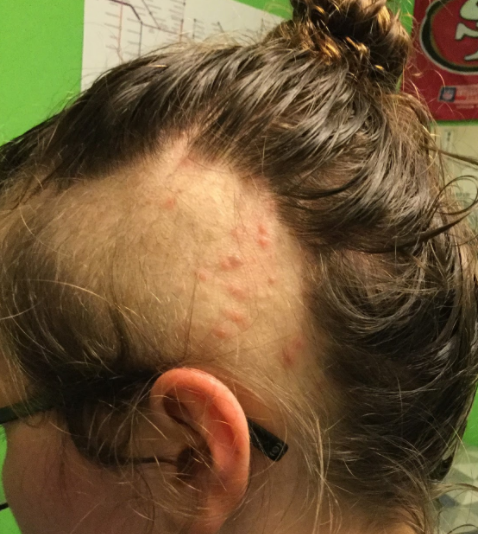 This complication can occur when trichotillomania patients often eat the hair they dislodge. 0 Response to "What Is Trichotillomania?"